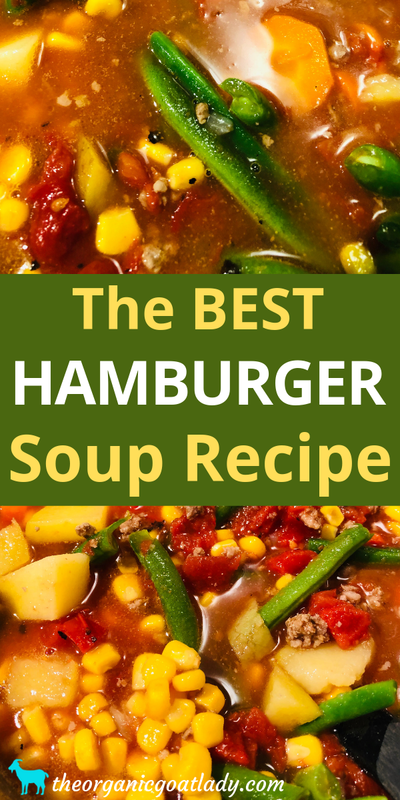 Are you looking for a delicious and easy hamburger soup recipe? 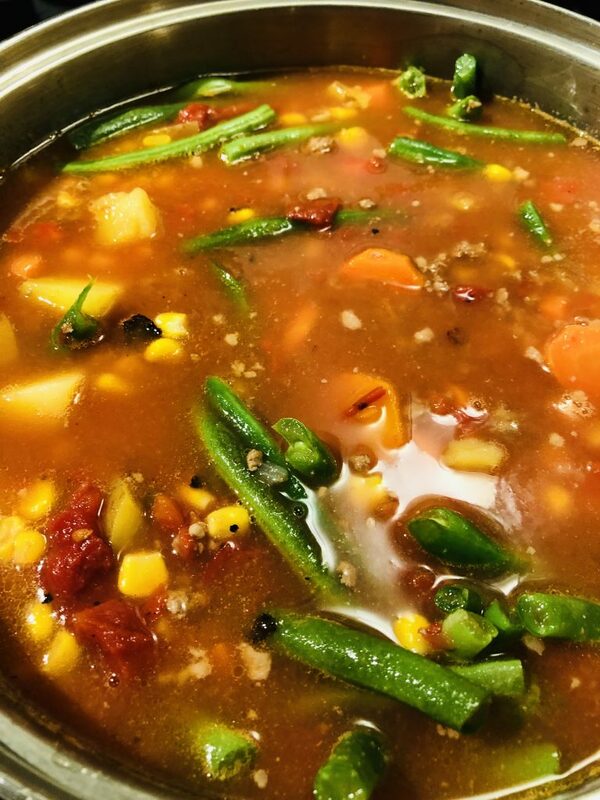 This awesome pot of goodness is the best hamburger soup! It will definitely become a family favorite and a regular on your dinner table! As I mentioned in my Instant Pot Bone Broth recipe, I looove soup! Not only is soup (especially when it’s made with bone broth:) incredibly healthy but it is a wonderful comfort food. Whether you are sick or well, it’s a great easy meal. One of my favorite ingredients in this soup is bone broth. Bone broth is so nutritious! It is full of minerals that we need and is excellent for strengthening the gut and the immune system! You can learn how to make your own amazing Instant Pot bone broth here! Trust me, if you have never made bone broth in the instant pot, try it! It is so easy and fast! You definitely won’t want to go back to making it in the Crockpot after making it this way! 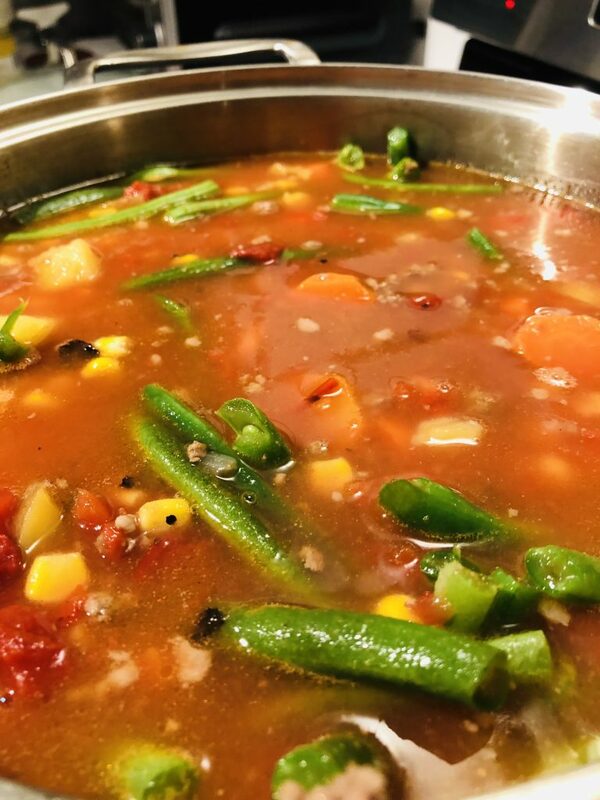 In addition to the broth, this soup contains lots of veggies that are also so good for you! I strive to always use organic veggies, and of course grass-fed organic beef, or even lamb or ground venison as well! The hamburger that I used in the pictures in this post is actually deer burger. Which is the ultimate grass-fed meat in my opinion! Wild meat is so good for you! To make hamburger soup you want to start by adding your hamburger and chopped onion to a large pot. I use an eight quart or ten quart pot to make my soup in. Remember, I’m feeding six, so this recipe is large. But you can always scale it back, or better yet, freeze the leftovers for later! You want to cook it until the meat is browned and no longer pink. If there is a lot of grease in the pot you can drain it if you would like. Because I am usually using venison or lamb that my parents raise, my meat is pretty lean and I tend not to drain the small amount of fat that is in the pot. Remember, that is where the flavor is! While your meat is cooking you want to chop and peel your veggies! Veggies, such as carrots, that I grow myself I tend not to peel, as this is where lots of nutrients are. However, I do like to peel store bought carrots because I’m paranoid about where they’ve been;) totally your call though! I usually add to my soup carrots, corn, peas, red potatoes, green beans, and a can or jar of crushed tomatoes. I say usually because the awesome thing about this soup is that it’s flexible. If you don’t like a veggie simply leave it out! Or if you have another favorite veggie that you’d like to add, give it a try! After your meat is browned you want to add in the carrots and potatoes. These bigger root vegetables benefit from being added first to give them a chance to cook and become tender. Mix them up with the meat and remember to stir frequently to keep the meat from sticking to the bottom of the pot and burning. After adding carrots and potatoes add in the crushed tomatoes and about half of the broth. I like to add only half of the broth so that I make sure that I have plenty of room left for the rest of my ingredients. Once all of the ingredients are in I will then add more broth to fill the pot. Next add the remaining veggies and top off the pot with the remaining broth. Season the soup with salt and pepper and bring it to a boil for a few minutes. Then reduce the heat and simmer until the potatoes and carrots are tender. 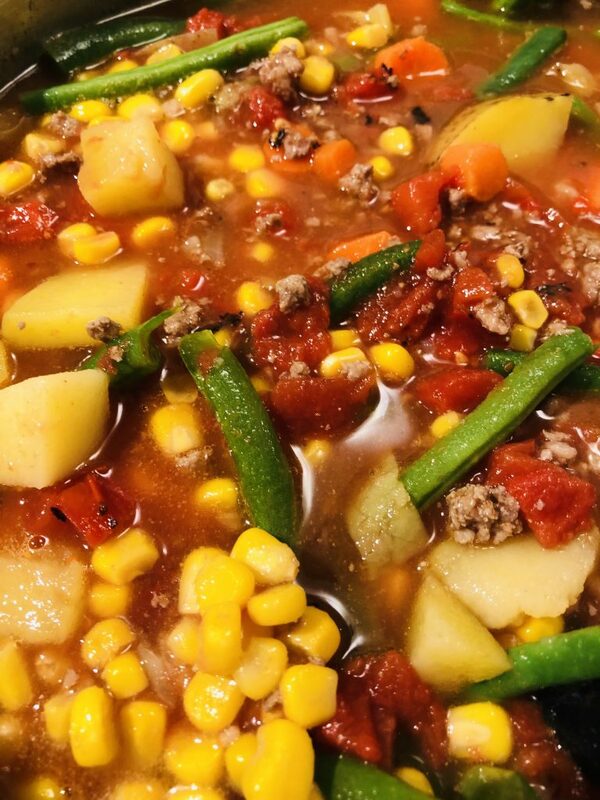 This is the best hamburger soup recipe! 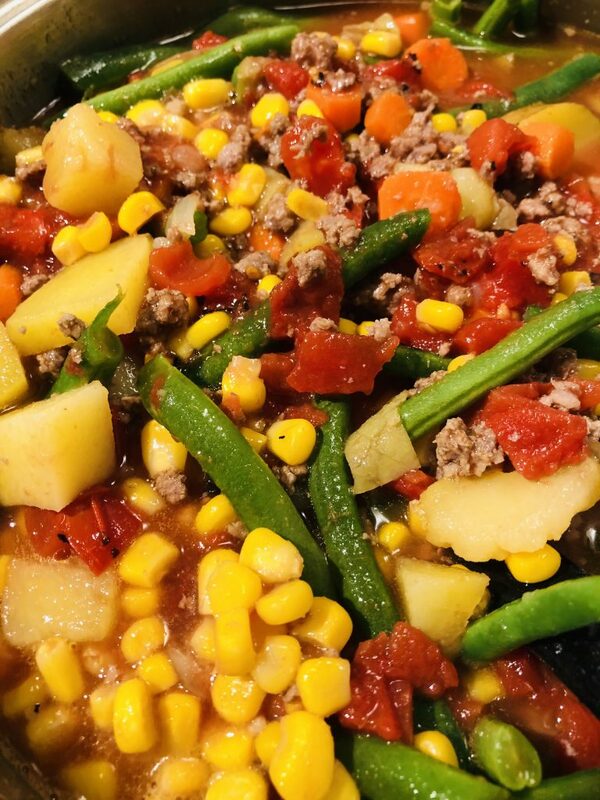 You will love it because it's healthy and your family will love it because it's delicious! 1. Add meat and onion to pot and cook until meat is brown and no longer pink. 2. Add carrots and potatoes. 3. Add crushed tomatoes and broth (about half of broth to start). 5. Add remaining broth to fill pot. 7. Bring to boil, then reduce heat and simmer until potatoes and carrots are tender. See post above for instruction details.